Looks one of the fan favorite Mighty Morphin' Power Rangers villains, the golden armored space alien Goldar, will be also included in the upcoming Power Rangers reboot movie! 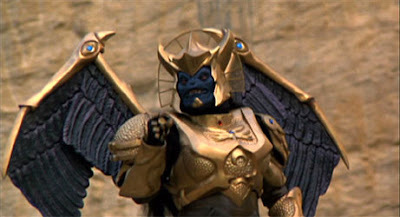 This was announced and confirmed earlier at the Power Rangers movie panel in NYCC 2016 with director Dean Israelite telling fans what will be expected in the movie like putties, space ships and then, Goldar. Directed by Dean Israelite, Power Rangers The Movie will premiere in cinemas next year, March 24, 2017. Make him significantly more intimidating and I'll have no complaints.